This Nintendo Switch Starter Accessories Bundle Kit designed by Mebarra is convenient and practical. 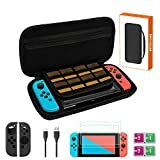 The Hard Travel protective carry Case for Nintendo Switch Made by hard EVA, durable, lightweight carrying case especially designed for Nintendo Switch, controllers game cards and accessories. Package including 1 pc Carrying Case. 1 pc 1.5M charging cable. 2 pcs tempered Glass Screen Protector. 1 pair anti-slip silicone cover for joy-con controller. 【Large Storage and Super Convenient】：A mesh pocket of the swtich case with high quality zipper provide storage room for small Nintendo switch accessories like charging cable, ear buds, and extra joy-cons. Rubber Handle and detachable strap for easy carrying around. 【With Full Range of High Quality Accessories】： 2 pcs Tempered Glass Swtich Screen Protector with 99.9% transparency, durable, and scratch resistant Specifically designed for Nintendo Switch ;1 pair High quality black silicone cover , securely attach to the Joy-Con controllers; 1.5M Type C USB charging cable with 2AMP output for quick and convenient charging of your devices.